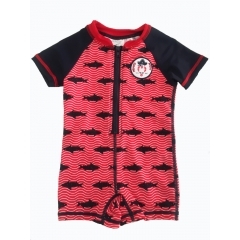 We supply various styles of boys swimwear,such as boys rash guards swimsuits,boys swim shorts and so on.We are one of the best wholesale swimming suits manufacturer in China. Your boy with be the coolest looking guy on the beach in these shark swim trunks. Easy pull on trunk with elastic waistband. These trunks is all your boy need to be ready for either the beach or the pool. Active fun boy's swimsuit trunks perfect for stylish summer swimming. Swim Trunks Or Board Shorts, This Pair Can Handle Both. Sun boys swim shorts are super lightweight and comfortable! Boys Love These Super Comfortable Octopus Swim Shorts In Blue Color. Colorful underwater world.your boy will love this one piece swim suit ,it will be make him look cutely! Blue Disney Batman toddler boys swim shorts,close fitting,soft and comfortable! Does your kids like horse?he will love this Sea horse one piece swim suit ,it will be make him look cutely! 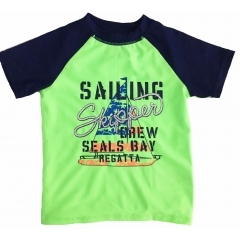 Keep Your Little One And Comfortable At The Beach Or By The Pool In This Adorable Toddler Boys' Rash Guard Featuring The Sailboat. Boys Love These Super Comfortable Octopus Swim Shorts In Black Color.